Pictured below are frequent costars Charles Bronson and Lee Marvin, two wintery heroes between takes on the set of their last film together in 1981. The two men starred together completely by accident in their first film and costarred again as superstars near the end of their careers. 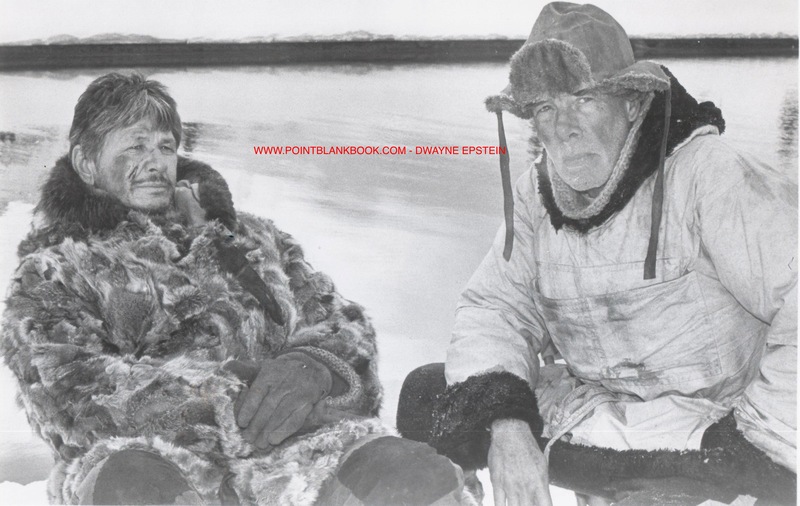 In between had been several other movie & TV projects as discussed in Lee Marvin: Point Blank (everything from Biff Baker, USA to The Dirty Dozen), making the wintery climes of Death Hunt both symbolic and bittersweet. This entry was posted in Blog and tagged 1981, Charles Bronson, Death Hunt, Dwayne Epstein, Lee Marvin, Lee Marvin Point Blank by Dwayne Epstein. Bookmark the permalink. Thanks so much for sharing this photo. As I told you earlier, I just loved this movie. Perhaps part of that is having lived in “Bush” Alaska for 8 years where the weather was certainly comparable to that at the movie’s location.